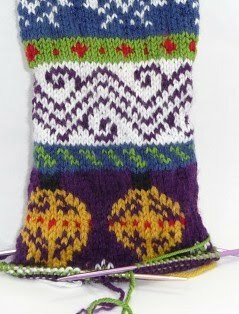 I had my doubts when I decided to go with the ornament pattern for the next motif. I even sat down with graph paper and pencil to design a smaller version, but quickly found that with a stitch count of 64 to work with the smallest pattern repeat I cold get is 8; and my end result would pretty much be exactly what the given pattern is. I keep looking at my knit stocking and from one angle I think it's ok and from another angle I'm totally not liking it. RIPPPPPP! When you're not happy about something and have the chance to change it; you'll be happier in the end to go ahead and change it even though you hate to see all that work get frogged! I'm sure the biggest problem is my color choice. I really didn't want to do another white background because I didn't want the ornaments to look so big so I thought if I made them with a darker background that they wouldn't be as noticeable. Yuk, I don't like! I'm thinking it's really the gold I don't like. Anyway, thought I would post this pre-frog picture. Bummer, huh.